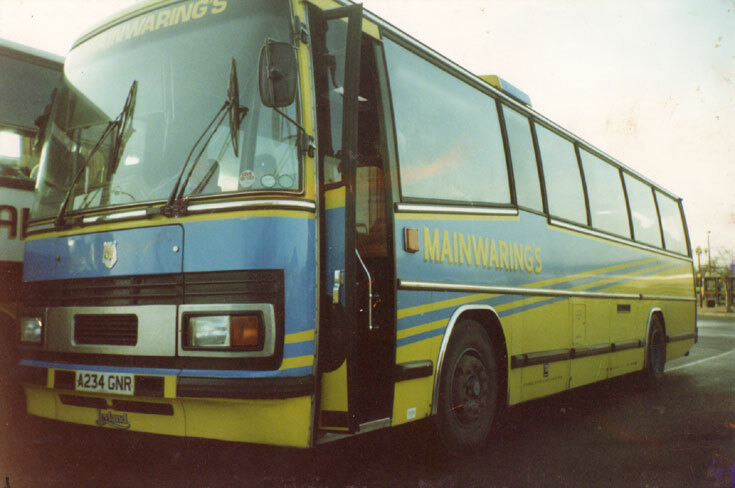 One of D J Mainwaring and Sons Ltd's old vehicles, Leyland Tiger A234GNR. Added by Mike Mainwaring on 17 September 2008. Added by Mike Mainwaring on 23 September 2008. Lost A379ROU it was chopped up 3 weeks ago in Ireland, the last keeper said there was nothing wrong with it just the actual age. Are you the person advertising for the whereabouts of this coach in the Whitstable Times recently? I am a member of an enthusiasts group based in Kent which tries to keep track of all the local coach operators fleets. We know that A234 GNR was with Chalkwell Coaches of Sittingbourne from 7/91 and are fairly sure it was re-registered to KIW 7360 in 9/91. They owned it until around 2003 but we lost track of it afterwards. There's no mention of Kent County Council, but perhaps they handled it in a dealer capacity and resold it soon afterwards (unlike A379 ROU which stayed with Kent CC for a while). which gives contact details (068 45162 or 087 2522402). If this is the firm that you understand has cut up A379 ROU, then maybe they swapped identities at some stage while in Kent? Sorry if this creates as many questions as it answers, but hope it helps. Added by Derek Jones on 14 October 2008. Added by Mike Mainwaring on 15 October 2008. Over the moon we've found her, been in touch with operator and we're picking it up in december. Thanks to all who helped and this magnificent web site too. Added by Mike Mainwaring on 18 October 2008. Nice to see what a site like this can do, of course in December we can expect even more pictures. Added by Andrew Wright on 19 October 2008. Added by Mike Mainwaring on 24 February 2009. Added by Andrew Wright on 26 February 2009.